Century Cycles Blog: U.S. Bicycle Route System - Build It. Bike It. Be a Part of It. U.S. Bicycle Route System - Build It. Bike It. Be a Part of It. During National Bike Month, the Adventure Cycling Association is raising $50,000 to support the creation of the United States Bicycle Route System (USBRS). 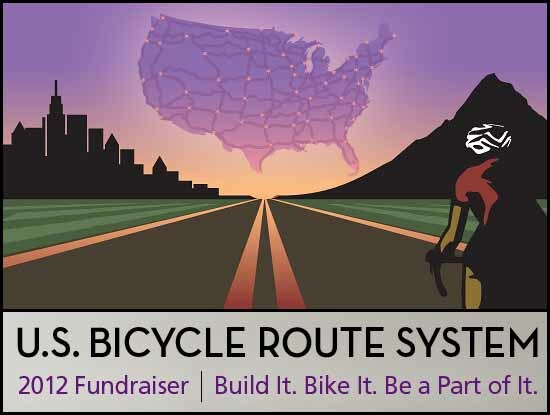 Donate today or become a core supporter and help raise funds to build this national network of cycling routes. What is the U.S. Bicycle Route System? It is a proposed national network of bicycle routes. For a route to be officially designated a U.S. Bicycle Route, it must connect two or more states, a state and an international border, or other U.S. Bicycle Routes. The benefits for cyclists of all types are numerous, mainly an established and mapped route network that can be used for tourism or everyday transportation, and heightened awareness to all road users of the legitimacy of bicycle travel.